The word Akshardham, as per Swaminarayan Hinduism, means the abode of the Lord. It represents the serenity and the holiness of the place where devotees worship the divine and seek their blessings. It is considered to be divine home of the God on Earth. Swaminarayan Akshardham Delhi is not only a temple; Swaminarayan Akshardham complex is also a cultural and spiritual campus where varied kinds of activities and exhibitions related to Hindu religion and harmony are organised. Akshardham Temple God is Bhagwan Swaminarayan. However, it is also dedicated to great saints, devas and averts of Hindu Gods. Skilfully carved Akshardham Mandir houses the idols of Bhagwan Swaminarayan and his successors. There are also statues of Hindu Gods and Goddess such as Lord Krishna and Goddess Radha; Lord Rama and Goddess Sita; Goddess Lakshmi and God Narayana; Lord Shiva and Devi Parvati. Located on the banks of Yamuna River, this temple was opened to public in the year 2005. It was inaugurated by Dr. A.P.J. Abdul Kalam. Built according to Vastu shastra and Pancharatra Shastra, Akshardham Delhi presents a traditional architecture of Hindu Temples. Akshardham Mandir Delhi was officially opened to public on 6th November 2005. It was inaugurated by president of India late Dr. A.P.J. Abdul Kalam. It took around 5 years of time to build the entire Swaminarayan Akshardham complex as per the ancient methods such as Vastu shastra and Pancharatra shastra. Located on the banks of River Yamuna, this temple is close to the 2010 Commonwealth Games village. The idea of temple complex was conceived by Yogiji Maharaj around 1968, the then spiritual head of BAPS. Later in 1982, his successor Pramukh Swami Maharaj started the work towards the construction of Akshardham complex. In 2000, 60 acres and 30 acres of land were offered by Delhi Development Authority and Uttar Pradesh government respectively for the project. In the month of November 2000, the construction for the temple complex was started which was completed in about 5 years. It was then officially opened in November 2005. The inauguration function was attended by the then Prime Minister of India Mr. Manmohan Singh and leader of opposition Mr. L.K Advani as well. Akshardham Delhi has also been bestowed with Guinness world record for being the largest comprehensive Hindu Temple in the world. Constructed with pink sandstone and marble, Akshardham Mandir is the centre of the Swaminarayan Akshardham complex. The vast complex of Swaminarayan Akshardham Delhi comprises of the main temple, beautifully laid out gardens, exhibitions, open courtyards and water bodies, each section presenting an intriguing aspect of Hindu religion and spirituality. Built in the traditional Hindu architectural style, Akshardham Delhi has been built as per ancient Indian architecture. It follows the traditional Vastu shastra as well as Pancharatra Shastra. Mandir and the entire complex display intricate carvings of flowers, animals, musicians, dancers and Hindu deities. The material used in constructing the temple – red sandstone from Rajasthan and the Italian Carrara marble, presents an alluring contrast which adds to the overall beauty of the structure. For the construction, more than 6,000 tons of pink sandstone was brought from Rajasthan. Akshardham Temple- It stands majestically with a height of 141.3 feet and is spread with a width of 316 feet. It comprises of around 234 pillars that have been carved beautifully. It has 9 elaborately adorned domes along with 20 quadrangle peaks. There are around 20,000 idols related to Hinduism at the temple. The main statue of Swaminarayan is 11 foot long, and is placed under the central dome. The main deity is surrounded by statutes of other great sages. There are also statues of other Hindu Gods and Goddess. Each statue at the Akshardham Mandir has been constructed with five metals known as panch dhaatu. Gates at Akshardham - The first thing to greet you at Akshardham Delhi are the majestic gates. There are 10 gates which are symbolic of 10 directions. As per Hindu beliefs these ten gates symbolizes accepting good from all directions so as to nurture the feeling of oneness and peace in the world. Visitors pass through Bhakti Dwar, also known as Gate of Devotion to enter the Akshardham Delhi. From here, they enter the Visitor Center. There are two Mayur Dwars also known as Peacock Gates. Between these two Mayur Gates is the ‘Charnarvind’. It is a huge replica of the footprints of Bhagwan Swaminarayan. It is built in marble and has water showers from all four sides. The holy footprints also comprise of 16 holy symbols. Garbhagruh- The inner sanctum of the temple is called as garbhagruh. It consists of idols of Bhagwan Swaminarayan and other saints who succeeded him such as Gunatitanand Swami, Yogiji Maharaj, Shastriji Maharaj, Pramukh Swami Maharaj and Bhagatji Maharaj. Around the inner sanctum, there are altars especially for Hindu deities such as Shri Shiv-Parvati, Shri Sita-Ram, Shri Lakshmi-Narayan and Shri Radha-Krishna. Mandapams- Inside Akshardham Temple visitors will see nine mandapams, each adorned with intricate carvings on pillars, domes and ceilings along with captivating statues. The interiors of these mandapams present a hypnotic beauty. The main mandapa inside Akshardham Temple is Swaminarayan Mandapam which is the central sanctum of the temple, symbolising the divine abode of the Lord. With a height of 72 feet, Paramhansa Mandapam which is another mandap, is decorated with exquisitely carved domes and pillars. It has the idols of paramhansas of Bhagwan Swaminarayan who were introduced to monkhood by Shri Swaminarayan. 38 feet high is the Ghanshyam Mandapam which is built on eight pillars and showcases a wide dome in the shape of a saucer. The pillars and ceiling of this mandapa displays the incidents from the childhood of Bhagwan Swaminarayan. 72 feet high Lila Mandapam has four faced pillars that have been carved with the stories of Bhagwan Swaminarayan’s life. It has engraved dome as well. Neelkanth Mandapam consists of an idol of Neelkanth Varni and is adorned with eight sided pillars and carved dome. Bhagwan Swaminarayan is known as Neelkanth Varni after he set out on his 7 years long pilgrimage. Smruti Mandapam as the name suggests, is the place where holy remains such as clothes, hair, beads, footprints, etc., of Bhagwan Swaminarayan have been preserved and kept for darshan. Sahajanand Mandapam is 32 feet high mandapam with carved dome. It has idol of Bhagwan Swaminarayan shown sitting under a neem tree. The name of this mandapa denotes the names Sahajanand which was given to Bhagwan Swaminarayan when he was initiated as a sage. Bhakta Mandapam comprises of 148 statues of devoted followers of Shri Swaminarayan. In Purushottam Mandapam there is statue of Bhagwan Swaminarayan with his devotee Akshar. Mandovar- Mandovar is the outer portico of the temple. Mandovar of Swaminarayan Akshardham Delhi boasts of being one of the largest in the country. Consisting of 2000 stone sculptures of great Hindu saints, avatars as well as devotees, it is 25 feet high and is 611 feet long. Jagati, the base of Mandovar is adorned with carvings of living beings ranging from animals of present days to those from Puranic times. Each layer of Mandovar consists of intricate carvings depicting various Hindu concepts of life, spirituality and God. Narayan Peeth-It is path for devotees to perform pradakshinas of the Akshardham Temple. It has a 60 feet long relief panels made up of bronze depicting incidents from Bhagwan Swaminarayan’s life. Gajendra Peeth or Elephant Plinth- Lower pradakshina of Akshardham Temple is called as Gajendra Peeth. It showcases representation of elephants, their relation with human beings as well as incidents from Panchtantra stories. Gajendra Peeth represents ancient architecture style of depicting base of elephants at palaces and temples. Yagnapurush Kund- Built in the same way as the traditional step wells, Yagnapurush Kund has more than 2800 steps and 108 small shrines. The central pool has been designed in the shape of nine lotus flowers. There is a 29 feet high bronze statue of Neelkanth Varni in front of the step well. It is the place where Sahaj Anand Water Show is organised. Thematic Gardens- Akshardham Delhi has two breath taking gardens. These gardens, not only add beauty to the Akshardham campus but also showcase beautiful sculptures of great Indian personalities. Bharat Upvan is one of the two gardens at the temple complex. Along with vast spread of lush greenery, it has bronze statues of ancient warriors, freedom fighters, national leaders and other prominent personalities of India. The other garden, Yogihriday Kamal has been built in the shape of lotus flower. This garden has been named after the 4th successor of Shri Swaminarayan, Yogiji Maharaj who inspired the construction of the temple on the riverbed of Yamuna. The timings of thematic gardens at Akshardham Mandir are from 9.30 AM to 7 PM. The entry to the garden is free of cost and it closes by 6.30 PM. Abhishek Mandap- At this mandapa devotees can perform abhishekam of Neelkanth Varni idol which was consecrated in 2005 by Pramukh Swami Maharaj. This 10 to 15 minutes long process comprises of chanting shlokas, tying the sacred thread and bathing the idol with sacred water. For the Abhishek, devotes are required to pay a donation of Rs.50. Narayan Sarovar- A water body surrounding the Akshardham Mandir Delhi has been constructed. This water body constitutes holy waters from around 151 rivers and lakes including Prayag Triveni Sangam, Manikarnika Ghat, Manasarovar, Pushkar Sarovar, River Ganda, etc. On the exterior walls of the temple, 108 gaumukhs of bronze has been made, symbolizing the 108 names of the Lord. Along with the impressive architecture, Akshardham Temple attracts visitors with amazing range of exhibitions which are organised in three huge halls, each presenting a unique experience. The three halls are Sahajanand Darshan, Neelkanth Darshan and the Sanskruti Darshan. Timings of exhibition shows at the temple are from 10 AM to 8 PM. The ticket counter is open till 7 PM. The shows are organised at every half an hour, they are conducted in both Hindi and English languages. Separate tickets for individual shows are not available. Visitors can buy exhibition tickets from the ticket counter at Akshardham and enjoy all the shows. Akshardham ticket price for these exhibition shows is Rs.170 per person for adults while for elders above 60 years of age it is Rs.125 per person. For children of age groups 4 -11 years, the ticket price is Rs.100 per person. The entry is free for kids below 4 years of age. Sahajanand Darshan –The Hall of Values, Sahajanand Darshan presents various kinds of exhibits on topics ranging from non-violence, family harmony, and morality to prayers and many more. Multimedia technologies such as immersive projections, 3-D dioramas, audio‐animatronic figures, etc. are used in the exhibition. Neelkanth Darshan – Large Format Film, Neelkanth Darshan is a theatre with huge screen which is around 85 feet wide and 65 feet tall. The movie played here is on the life of Neelkanth Varni (Shri Swaminarayan) who at the age of 11 years decided to travel from Himalayas to Southern beaches on foot. The journey lasted for 7 long years. Withstanding the difficulties, understanding life, he preached the values of sacrifices and devotion. Akshardham Movie, Neelkanth Yatra, is known to be the first large format movie which has been made by an Indian organisation on India. This Akshardham Movie was shot in 108 locations and has more than 45,000 casts. Sanskruti Darshan/ Boat Ride – Sanskruti Darshan is the most popular of all the exhibitions at Akshardham Delhi. It is a cultural boat ride which is around 12 minutes long. In this ride, visitors sail across sets presenting a glimpse into the ancient Indian lifestyle and advancements. Boat Ride at Akshardham Temple takes you through captivating representations of Vedic marketplace, Yoga practices, game of Chess, ancient set up of classroom at Takshashila, various stages of surgeries done in ancient India, etc. Akshardham boat ride timings are from 10 AM to 8 PM, however the ticket counter closes by 7 PM. The ticket price for Boat Ride at Akshardham Temple is within the ticket cost exhibition shows, which is Rs.170 per person for adults, Rs.125 for visitors above the age of 60 years and Rs.100 for children of the age of 4 to 11 years. The commentary is done in Hindi language. However, one can also request for English commentary. Akshardham Musical Fountain and the water show is the major attraction of this temple. It is undeniably the most popular musical fountain in Delhi. Conducted at Yagnapurush Kund, Sahaj Anand Water Show is a breathtaking blend of technology with creativity. Akshardham Light & Sound presents story from ancient Hindu scriptures Kena Upanishad. A multitude of technologies are used in the show such as varied colours of lasers, water jets, underwater flames, surround sound and video projections; all of which are synchronised aptly, creating an absolutely stunning view. The show has been developed with the help of experts from all over the world, BAPS volunteers and sadhus. Akshardham Light & Sound show timings usually starts after sunset. Presently the shows are from 7.30 PM from Tuesday to Sunday. Number of Akshardham water show & timings can vary sometimes. For instance, on weekends and holidays there are more number of shows. The musical fountain show is 24 minutes long and is conducted in Hindi language. Akshardham ticket price for the show is Rs.80 per person for adults and Rs.50 for children between the age group of 4-11 years. The entry is free for children below 4 years of age. Akshardham Temple opens every week, from Tuesday to Sunday. Akshardham Delhi closing day is Monday. Timings of Akshardham Temple are from 9.30 AM to 6.30 PM. Mandir Aarti timings are from 10 AM and 6 PM. While for the various shows and exhibitions, the opening time of Akshardham complex is 9.30 AM and the closing time is 8 PM. Facility of wheelchair is offered at the BAPs Akshardham Temple. It can be taken at Gajendra Peeth which has enough space. However, the mandir area and the Narayan peeth cannot be accessed via wheelchair. Like other Hindu place of worship, shoes are not allowed inside the temple. Akshardham Temple entry is free of cost. Visitors can enter and offer their prayers at the temple without any ticket cost. However, an entry fee is charged for the various shows such as Akshardham Laser Show, Boat ride at the temple or the Akshardham movie show. The Akshardham ticket price for these shows differs with the program one selects. Akshardham Mandir Delhi is easily accessible from all the parts of the city. It is well connected via public transport ranging from government run buses to metro railways. The nearest metro station to the Swaminarayan Akshardham Delhi is Akshardham Metro Station which is only 350 meters away. Hence, tourists can get down at this station and walk to the temple. If interested, one can also hire an auto rickshaw to the temple in minimum fare. The distance from Delhi Airport to Akshardham Temple is around 21 km which can be covered within 1 and half hours of time. The common route to the temple from airport is via Thimayya Marg. If you are travelling from Gurgaon, then you will require around 2 hours or slightly more than that to reach the temple. Gurgaon to Akshardham Temple distance is about 43 km while Delhi to Akshardham distance is 31 km which can be covered in 1 hour of time via NH9. From Karol Bagh to Akshardham temple it takes around 50 minutes of time as the distance between the two is about 12.6 km. What is the meaning of Akshardham? Akshardham means the abode of almighty. 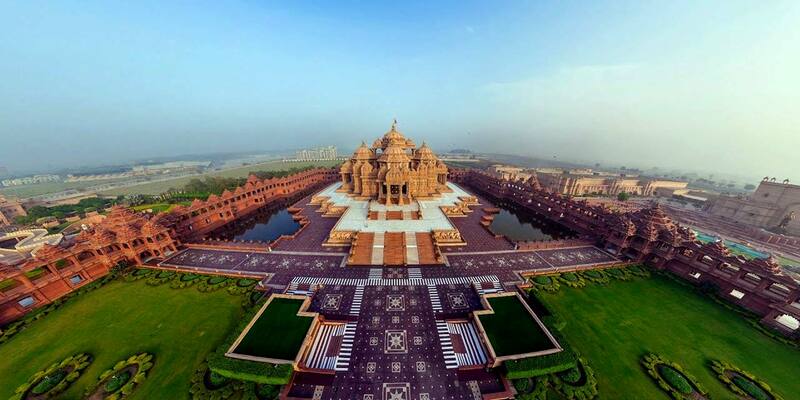 The word Akshardham is a combination of two letters, Akshar, which denotes immortal and Dham, which means home. Hence, Akshardham is considered as the holy place of Swaminarayan. It is also believed to be the place where the divine resides; the place where virtues and devotion prevails. In which city the famous Akshardham temple is situated? The most famous Akshardham temple is situated in Delhi. However, there are Swaminarayan temples in various other parts of the country as well. What is the address of Akshardham temple in Delhi? The address of Akshardham Mandir is NH 24, Akshardham Setu, New Delhi - 110092.
Who is the architect of Akshardham temple Delhi? Akshardham Mandir Delhi is the creation of Pramukh Swami Maharaj. The team assigned with the project of constructing the temple consisted of eight sadhus. More than 7000 carvers and 3000 volunteers worked for building this impressive structure. Akshardham Temple is built by Pramukh Swami Maharaj. Where is Akshardham temple located in Delhi? Akshardham temple is located in Noida Mor of New Delhi. Is Akshardham also open on Sunday? Yes Akshardham is open on Sundays. Akshardham closing day is every Monday of the week. Is there any Laser Show at Akshardham of Delhi? Yes there is laser show at Akshardham Delhi. The Sahaj Anand Water Show which also includes laser and sound show is organised every day at Yagnapurush Kund of the temple. The show is around 24 minutes long.